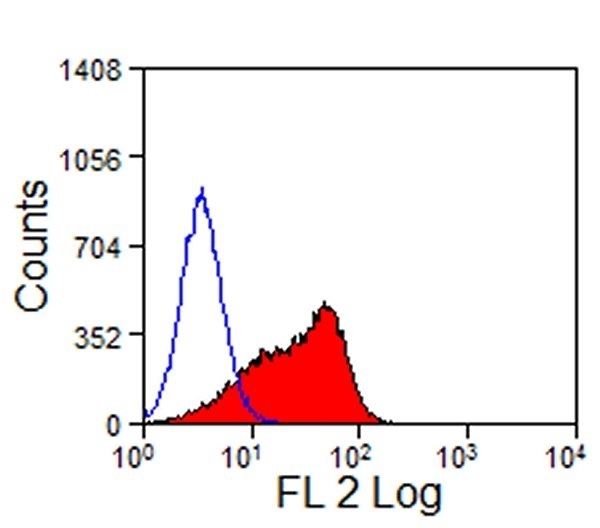 Hamster anti Mouse Delta-Like Protein 4 antibody, clone HMD4-2 recognizes mouse Delta-like protein 4 (DLL4), one of the five major ligands of the Notch signalling pathway, which is activated through the binding of specific ligands to the Notch receptors Notch 1-4. The Notch signalling pathway is an evolutionarily conserved pathway in multi-cellular organisms, which is vital for cell-cell communication, important during fundamental developmental and physiological processes, including regulation of cell fate decisions during neuronal, cardiac and endocrine development, stem cell haematopoiesis, thymic T-cell development, and both tumour progression and suppression. Ligation of Notch receptors by their specific ligands, Jagged1 (CD339), Jagged2, Delta like-1 (DLL1), DLL3 and DLL4, on physically adjacent signal receiving cells, induces proteolysis of the receptors by ADAM-family metalloproteases and gamma-secretase complex, within the transmembrane domain, releasing the Notch intracellular domain (NICD) to translocate to the nucleus. Subsequent signal transduction then occurs through either the CSL-NICD-Mastermind complex cascade (canonical pathway), or NF-kappaB-NICD and CSL-NICD-Deltex complex signalling cascades (non-canonical pathway). The canonical pathway inhibits the differentiation of stem cells or progenitor cells, whilst the non-canonical pathway promotes differentiation. DLL4 is expressed by vascular endothelium, and plays a vital role in embryonic vascular development. DLL4 signalling has been shown to play a role in the angiogenesis of clear-cell renal tumours, and pancreatic, bladder and colonic cancer. Studies have shown that DLL4 expression in endothelium cells, can be up-regulated by vascular endothelial growth factor (VEGF) and basic-FGF, and by HIF1 alpha, and that blockade of DLL4 inhibits tumour growth by promoting non-productive angiogenesis. Spleen cells from immunised Armenian hamsters were fused with cells of the P3U1 myeloma cell line. Moriyama, Y. et al. (2008) Delta-like 1 is essential for the maintenance of marginal zone B cells in normal mice but not in autoimmune mice. Int Immunol. 20 (6): 763-73. Sekine, C. et al. (2009) Differential regulation of splenic CD8- dendritic cells and marginal zone B cells by Notch ligands. Int Immunol. 21 (3): 295-301. Yamanda, S. et al. (2009) Role of ephrinB2 in nonproductive angiogenesis induced by Delta-like 4 blockade. Sekine, C. et al. (2012) Differential regulation of osteoclastogenesis by Notch2/Delta-like 1 and Notch1/Jagged1 axes. Arthritis Res Ther. 14: R45. Bray, S.J. (2006) Notch signalling: a simple pathway becomes complex. Nat Rev Mol Cell Biol. 7 (9): 678-89. Iso, T. et al. (2003) Notch signaling in vascular development. Arterioscler Thromb Vasc Biol. 23 (4): 543-53. Hu, X. et al. (2008) Integrated regulation of Toll-like receptor responses by Notch and interferon-gamma pathways. Hoyne, G.F. et al. (2001) Notch signalling in the regulation of peripheral immunity.